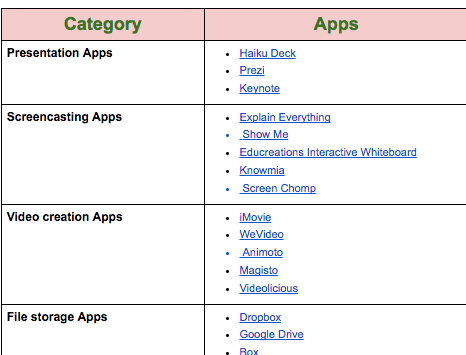 Earlier this week, Educator’s Technology released this handy chart, full of iPad apps for educators. 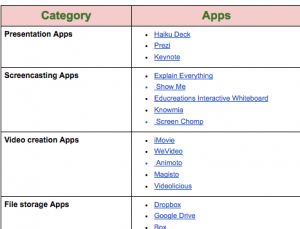 Although lists of so many apps can be overwhelming, this helpful infographic categorizes each app by function. Looking for an app to help students build graphic organizers? Scroll down to the “mindmapping” category, and click through the five suggested apps. Still can’t find what you are looking for? The Apple Store selects related apps to explore. Educator’s Technology is a great resource for educational web tools and mobile apps. Their Facebook feed sends me daily graphics with helpful links – a info-packed member of my PLN!